Services in pervasive computing systems must evolve so that they become minimally intrusive and exhibit inherent proactiveness and dynamic adaptability to the current conditions, user preferences and environment. Con-text awareness has the potential to greatly reduce the human attention and interaction bottlenecks, to give the user the impression that services fade into the background, and to support intelligent personalization and adaptability features. To establish this functionality, an infrastructure is required to collect, manage, maintain, synchronize, infer and disseminate context information towards applications and users. 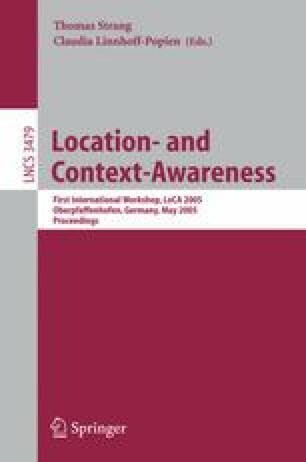 This paper presents a context model and ambient context management system that have been integrated into a pervasive service platform. This research is being carried out in the DAIDALOS IST Integrated Project for pervasive environments. The final goal is to integrate the platform developed with a heterogeneous all-IP network, in order to provide intelligent pervasive services to mobile and non-mobile users based on a robust context-aware environment.